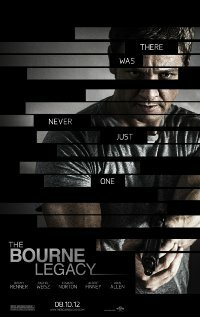 Review: “The Bourne Legacy” was written and directed by Tony Gilroy (“Michael Clayton”, “Duplicity”), who sought inspiration on Robert Ludlum’s Bourne trilogy. Curiously, or not so much, Peter Greengrass (director of the last two Bourne’s) refused to direct this movie. The same had happened with the leading role: Jeremy Renner was the chosen, after Matt Damon’s quit. Greengrass and Damon predicted well what was coming with this sequel: Nothing new! Without passion, action scene upon action scene, it could not arouse any thrilling effect, due to the stereotypes of a wobbly plot and a performance that lost the charisma left by Damon. “The Bourne Legacy” could not challenge or provoke because it simply didn’t have anything more valuable to offer, when compared to the other three movies from which it was based on.